My desire for the next season of Durarara!! has pushed me to revisit the first season quite a few times. And every time I do, my brain picks at a new detail that further enriches the series. Durarara!! (geez, that name gets old quickly) is a bit confusing at times but that is just a side effect of the multitude of layers Ryohgo Narita is playing with. One particular concept that caught my attention from the get-go is that of reality. I, for one, am an escapist, so the concept of reality and pondering whether an anime series is “looking out into the word” isn’t something that I often concern myself with. But Durarara! !, an anime brimming with folklore and myth, ironically brought my own reality into the foreground of my thoughts. Wow, who would have known; anime can actually teach relevant lessons. It is obvious that Durarara!! refers back to the real world. Yes, we have all seen that side to side comparison of places in Ikebukuro and their corresponding settings in Durarara!!. But there is much more to this connection. Warning: half of this is going to sound hella meta and far-fetched, you should stick around for the ride despite of that. What gives the story urgency is its reference back to the real world and the encompassing real life conflicts. In the story, Ikebukuro is a dangerous city filled with gang violence. Though in the real world Ikebukuro is not as dangerous as the series sets it out to be, Ikebukuro headquarters the Kyouto-kai yakuza gang. The story touches on the violence that is born from an undisciplined younger generation with too much time on their hands. Some of the antagonists in the story work in a corrupt pharmaceutical company. This detail references the real world skepticism and suspicion of Japanese pharmaceutical companies since 1950’s because of various drug scandals, doggy procedures in drug testing, and drug induced tragedies. The foreigners are a general reference to the small percent of immigrants that exist in japan, breaking the myth that Japan is totally homogenous. The story covers real-life issues in Ikebukuro or in any city: meet-up suicides /internet suicide pacts, ganguro fashion, social networking, kidnappings, Japan’s declining birth rate, sexually abusive teachers, murders, and other very realistic themes that force the audience to look out to the real world. But an even more cosmic idea is that the series is making an attack on the general notion of “understanding”, not only language, but also reality itself. It is asking humans to revaluate their place in their world, their understanding of their role as a ”free” human being. By displaying the interconnectedness of its characters, it questions how humans can be free if they are intrinsically part of a causal chain. Following this train of thought, the series tries to kill the notion of a holistic “truth” and one-track-mindedness; ideals that inhibits humans from looking out at the world and considering different perspectives. If there are so many different stories, even sides to the same story, is one version of the story really the “truth” or a whole “truth”? After all, we each might have our own realities. Nothing is black and white; it is a juggling of the possibility of different realities. And humans should follow suit, never being ruled by a dominant emotion. We can take each supernatural character to represent an extreme emotion: Celty represents a desperate longing to be complete, Izaya embodies selfishness and ambition, and Shizuo is personified anger and violence. The series poses these extreme emotions as something “unnatural” and “otherworldly” and that the only course of action is to demystify and settle them into our modern world. The series settles the characters into the modern reality by trapping them in the web of connections they made, taking away their otherworldliness and ability to act as a separate person. In a sense their own hidden, but very prevalent, human traits grounds them. Celty is grounded by the love she has for Shinra, an underground doctor that takes care of her. She loses her one-track-mindedness when her sense of incompletion from the lack of a head rivals her sense of completion when near Shinra. Shizuo uses his wrath-powered strength for the sake of his friends, the sense of companionship and a need to protect fueling his actions instead of anger. And Izaya’s plans are thwarted and he feels humiliation, taking away all of his ambitions to rise at the expense of his community (well, for now). Though the message of “keep an open mind and consider those you can affect with your actions”, a crude jab at what Durarara!! is trying to portray, is nothing new, the series pushes the limits of what it really means to be a multi-faceted human being. If the ability to accept that there is a possibility for a reality where a dullahan exists is part of the condition of staying “alive” as human beings, the human race has a long way to go. Yet, Durarara!! is adamant that this degree of open-mindedness can even stop wars. What a thoughtful write up Kiara! Thats what interested me most about Durarara!! Although its premise is ridiculous and its characters fantastical, theres an underlying sense of realism, especially when it directly relates and mirrors modern Japan ie corruption in Japanese pharmaceutical companies. Oh and welcome to the blog! Ive been an avid reader and commenter of Paul’s blog from its infancy and its been a while since i commented. What better way to start again than with welcoming a new blogger to the site! Thank you for the warm welcome! I’m happy you enjoyed the post. I think you nailed what it is about Durarara!! that cements its place in anime history. That image of Celty, the headless woman, riding a motorcycle in Ikebukuro is memorable, but I never really thought about how her image represents a “desperate longing to be complete” (although it seems obvious now you’ve pointed it out,) and not just that, she’s like a different person around Shinra. I just remember being surprised by the sheer amount of warmth being evoked by a person without a head. As you’ve pointed out, it’s a series that juxtaposes all of these other-worldly things against a modern, realistic civilization, and then proceeds to humanise it all. What are all of these monsters anyway, if not avatars for (our often suppressed) emotion? We created them for a reason, after all. Yes. We often create monsters to deflect our own flaws onto other things and dissociate ourselves from them. And I know, right! I am super excited for the next season as well. Once again, the writers of this blog humble me with their perceptiveness and understanding. When I review a story – be it anime, manga or whatever – I tend to look at it in a very… formulaic way, separating it into elements such as characters, plot, themes… and my analysis of each is often shallow and mechanical. Even when reviewing a very thematically deep story, I’m rarely able to dig into the themes and analyse them, like you do. Oh, and Drrr is a very good anime, I’m looking forward to the second season, too. I agree. I like how you deeply described how each character represents an emotion. I have recently started the Durarara!! series and I am in the middle of the first season. I enjoy its contrast of reality and fantasy. Your blog on this series had helped me understand the story line and the characters better. So far, on what I have seen, it is a very interesting anime. 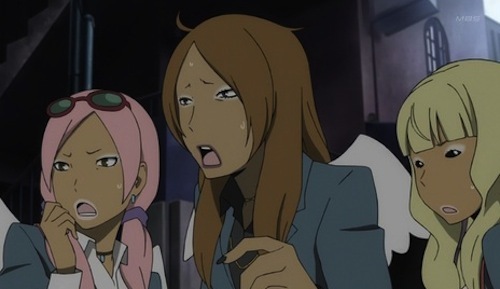 I am glad my friend had recommend I watch Durarara! !